If you’re a side sleeper looking for the best mattress to support your back, we’ve got the details you need to make an informed decision to grant you the best sleep of your life. By using our recommendations on firmness and fabric, pillows and sleeping patterns, you can achieve better rest and improve your overall health simply by purchasing the right kind of mattress. There are a number of mattress companies that claim to have the best mattress for side sleepers, and we will help you navigate through the characteristics and materials to find the best option for you. Side sleepers make up the majority of the population, as this is the most common sleeping position—meaning your choices of mattress are expansive. There are various health benefits to being a side sleeper. Resting through the night on either your left or right side can help alleviate pressure from your back and eliminate snoring, keeps your joints in beneficial positions, and can be a great help for those who suffer from acid reflux. Sleeping on your side even promotes better blood flow, and can be a greatly beneficial sleeping position for pregnant women. As such, you may think you’re in the clear for a good night’s sleep no matter what, but finding the best mattress for side sleepers is essential keeping yourself healthy and happy. Many believe that a firm mattress is the answer to all sleeping problems, but this is not true in the case of side sleepers. If you are currently using a firm mattress, and wake up with pain in either your hip or shoulder, then more likely than not your mattress is too hard to give you any real sleeping benefits. Because you sleep on your side, most of your weight is placed on the hips and shoulders, and the pressure on these points from a hard mattress can do more damage than good. This is not to say that soft mattresses are the way to go. If the mattress is too soft and gives too easily, the body will not receive the support it needs. The best mattress for side sleepers is one with a base of support that incorporates softer cushions; this combination will take pressure off of the joints and automatically conform to the natural arch and curves of your body. In order for your body to evenly distribute your weight, you’ll need a mattress that allows for contouring. Two wonderful material options for this are memory foam mattresses and latex offerings. Memory foam helps side sleepers in a variety of ways. Their supportive density combined with a plush surface make for a winning package of proper spinal support and comfort for the joints. A firm base combined with a soft overlay provides a cradle for the body that takes away stress from muscles. Memory foam comes with a variety of benefits for side sleepers. They spring back after movement, do not place too much pressure on heavier parts of the body, and use temperature sensitive material to ensure sleepers don’t overheat in the night. Memory foam can be found in a variety of weight densities, usually ranging from three to five pounds. On the low end of the weight spectrum, i.e. a three-pound density, sleepers will find their mattress bounces back quickly, is softer, and is less temperature sensitive. On the other end of the spectrum, i.e. a five-pound density, the mattress will bounce back more slowly, have a firmer feel, and maintain temperature more consistently. While most mattress foam options are right for side sleepers, there is something to be said about experimenting with the different weight offerings before purchasing. Latex foam mattresses are also a good option for side sleepers. While similar to memory foam mattresses, latex versions provide a bit of extra spring. Latex foam mattresses provide a natural curve of support while still sporting a similar feel to innerspring versions—without the nasty backaches. Yes, there are several mattress types that side sleepers should avoid. Both innerspring mattresses and waterbeds do not provide the proper spinal support. These mattress types tend to contort the body, causing sleeping positions that will lead to muscle ache. Spring mattresses don’t evenly support the body, pushing back on the areas with the highest weight—meaning the shoulders and hips as your main pressure points will take the brunt of the hurt. While our purpose is to help you find the best mattress for side sleepers, don’t neglect your neck and head, many doctors recommend side sleeping along with proper head elevation for the best night’s sleep. Take the time to find the perfect pillow to complement your new mattress choice. Having your head properly elevated is essential to ensure neck alignment, so you need to find a pillow that correctly balances the support your spine receives. Don’t get too thick of a pillow; the harsh incline will cause pain and discomfort throughout the night and into the next day. You may decide to purchase a pillow that is specifically contoured for side sleepers, but as long as you find a firm, flat option, your neck and back will feel the benefits. Amerisleep Liberty is definitely a contender for the best mattress for side sleepers. The temperature regulating fabric is a great option for those who live in hotter climates, as it will keep you cool in those hot summer monhts. With a medium firmness, there’s still enough plush to make this bed feel cloud-like while providing all the support a side sleeper could need. Side sleepers can really benefit from the sturdy base while indulging in a soft mattress. The Bio-Pur foam gradually bounces back upon movement, which was an excellent feature. It is created to ensure your pressure points are alleviated without interrupting your sleeping patterns. The Casper Queen Mattress was an excellent option for a variety of our test sleepers, but worked especially well for those who tended to sleep on their sides. We really like the feel of the latex top mixed with the inches of memory foam, as it created the support needed while still providing a plushy feel when laying down. It lets the body sink a tad, but not too much so as to lose support for your hips, shoulders, and joints. This mattress doesn’t need a foundation, so it can work on box springs or on its own on a platform style bed frame. This will work for a variety of bed frames, making it a versatile choice that can work for years. The set up for this mattress was wonderfully easy. It is surprisingly pliant and easy to bend, which made setting it up a breeze, and would be a great option for those who may need to move it in the future. We really like the fact that this mattress has a five-inch support base, which makes it ideal for side sleepers who need a bit of extra sturdiness. Your back will receive the support it needs throughout the night without tossing and turning. 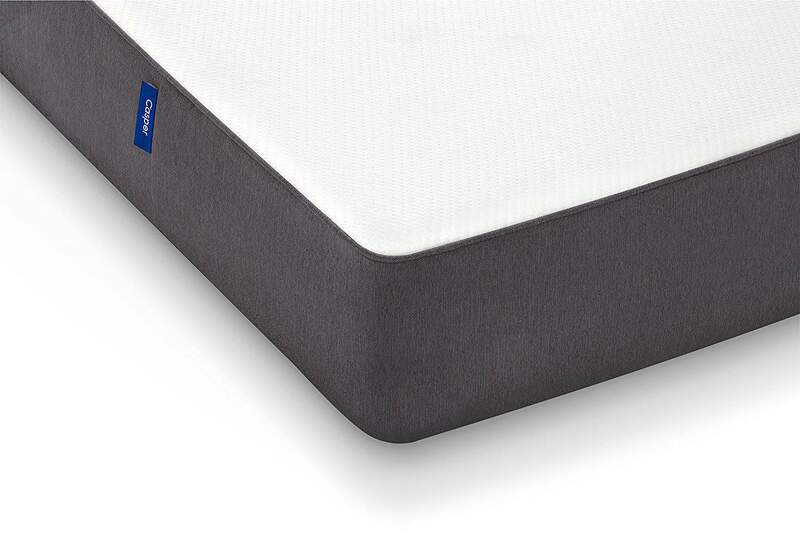 The mattress stays very cool throughout sleep because of the cooling gel feature, and it made for a great night’s rest. No longer will you wake up in the middle of the night from overheating. It was excellent at conforming to my body and I could actually feel the difference from my normal mattress in my joints when I woke up in the morning. This mattress is on the firmer side, so would do well for those side sleepers looking to benefit from a more rigid support system. We love the two layers of comfort on this comfy memory foam mattress. This is a three-pound density option, meaning it provides medium firm support while still cushioning your body, in exactly the places that need support. At 93 pounds, this mattress is a bit on the heavier side, so double check your bed frame weight capacities to ensure a good fit. While it is a heavy bed, it still is very versatile and could be used on a variety of frames. 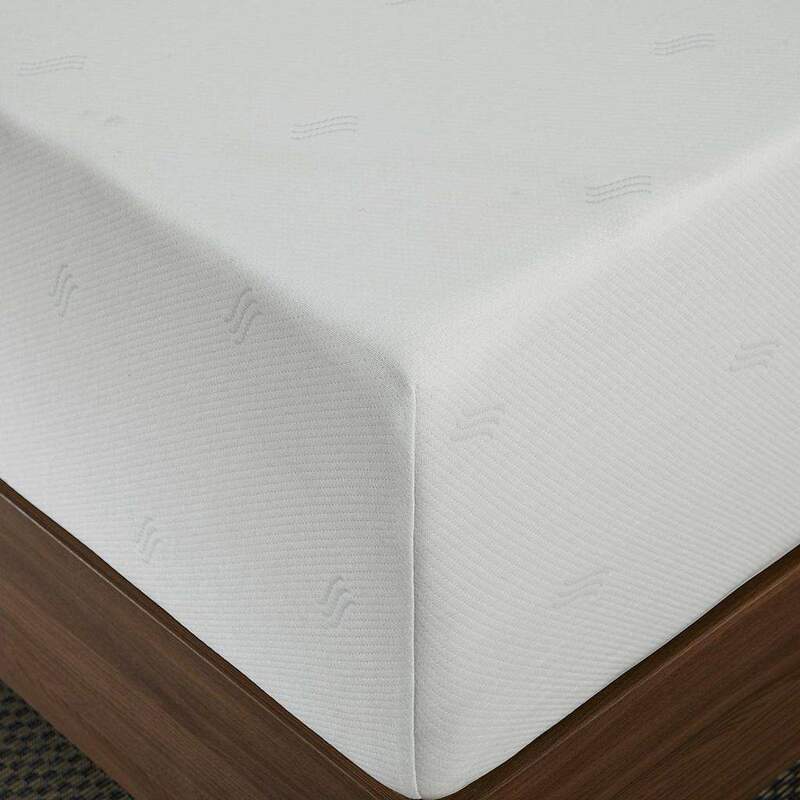 This mattress is also very well priced for the wonderful support and comfort it provides, making this a definitive good buy for anyone looking to support their spine on a budget. Note: Good sleep is invaluable. The DreamFoam Mattress is a wonderful option for those who sleep on their side. 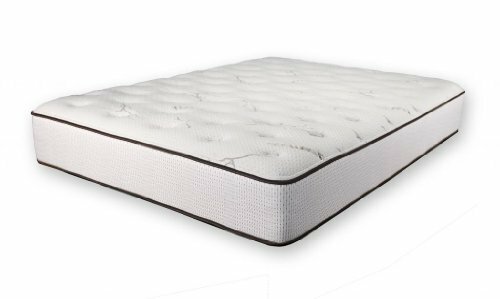 The high density base foam makes for a sturdy support, and the 10 inches of latex mean you’ll have a cushioned sleep that provides the firmness your spine needs. We like that you can customize your preferred firmness level; we ordered a number 6, which was just on the firm side of medium support level. This is a great place to start, but depending on preference you can adjust to your favorite softness or hardness. The mattress was lightweight, weighing in at only 75 pounds. This makes it the best mattress for side sleepers that have a bed frame with low weight capabilities. It would also be a great fit for sturdy platform bed frames.